For centuries the Knights Templar held immense influence in Europe. But whatever happened to them? Martin Hickes reports. Few societies of yore have the historical resonance of the Knights Templar. The subject of countless novels, fiction, documentaries and myths, the Poor Knights of the Temple of King Solomon, as they are properly called, once held sway in medieval Europe - and Yorkshire. Often the target of much speculation for conspiracy theorists, to some, in the popular imagination at least, they were the shadowy secret bankers who held the kings and noblemen of Europe in their power. To others, they were a noble, warrior religious order who were in the right place at the right time to capitalise on the need to safeguard the transportation of money safely across the burgeoning continent. Historical legend has it that they were dissolved swiftly on no other day than Friday October 13th, 1307, whether out of retribution or political malice, the true cause is still uncertain. But what happened to their once powerful order which, at its peak, had a key influence within every major royal house and capital in Europe, with many significant sites in Jerusalem? While major religious and secular orders from the past have persisted, how can it be that the order which once inspired awe among many has seemingly vanished? Yorkshire, aside from London, was the heartland of Templar influence in England, supplying both men and money to the cause, based on its strong agricultural and woollen economy. So important were the Templars' holdings in the county that a ' chief preceptor' or ' master' was appointed for Yorkshire from early times. The Yorkshire estates of the Templars consisted of the preceptories of Copmanthorpe (with the Castle Mills of York), Faxfleet, Foulbridge, Penhill, Ribston, Temple Cowton, Temple Hirst, Temple Newsam, Westerdale, and Whitley, and the manors of Alverthorpe and Etton. At one time in Yorkshire, the Templars were able to luxuriate in the unrivalled position of being exempt from taxes, and many of their workers and tenants also enjoyed this privilege. Dozens of houses and pubs across Yorkshire still bear the Templar cross – a sign to many that the building was a Templar holding – though many unscrupulous landowners also displayed the sign in the hope of dodging tax. But just as the Order was reaching the peak of its powers in Yorkshire and in Europe, it was rapidly dissolved, and many of the Templar buildings were left to ruin. The Knights Templar trace their origin back to shortly after the First Crusade. Around 1119, a French nobleman from the Champagne region, Hugues de Payens, collected eight of his knight relatives to protect pilgrims on their journey to visit the Holy Land. They approached King Baldwin II of Jerusalem, who allowed them to set up headquarters on the southeastern side of the Temple Mount. Since the Temple Mount was the reputed site of the biblical King Solomon's Temple, they took the name "The Poor Knights of the Temple of King Solomon", which later became abbreviated to "Knights Templar". But in 1129, after they were officially sanctioned by the Catholic Church at the Council of Troyes, their influence grew. Their fundraising campaigns asked for donations of money, land, or noble-born sons to join the order, with the implication that donations would help both defend Jerusalem, and to ensure the charitable giver of a place in heaven. The order's efforts were helped substantially by the patronage of Bernard of Clairvaux, the leading churchman of the time, and a nephew of one of the original nine knights. At its outset, the order had been subject to strong criticism, especially of the concept that religious men could also carry swords. In response to these critics, the influential Bernard of Clairvaux, wrote a multi-page treatise entitled De Laude Novae Militiae ("In Praise of the New Knighthood"), in which he championed their mission and defended the idea of a military religious order by appealing to the long-held Christian theory of a ‘just war’, which legitimised “taking up the sword” to defend the innocent and the Church from violent attack. By so doing, Bernard effectively endorsed the Templars, who became the first "warrior monks" of the Western world. Donations to the Order were considerable. The King of Aragon, in the Iberian Peninsula, left large tracts of land to the order upon his death in the 1130 and new members to the Order were also required to swear vows of poverty, and hand over all of their goods to the monastic brotherhood. In 1139, even more power was conferred upon the Order by Pope Innocent II, who issued the papal bull, Omne Datum Optimum. It stated that the Knights Templar could pass freely through lands, owed no taxes, and were subject to no-one's authority except that of the Pope. The Order grew rapidly throughout Western Europe, with chapters appearing in France, England, and Scotland, and then spreading to Spain and Portugal. The Templars were becoming the elite fighting force of their day, highly trained, well-equipped and highly motivated; one of the tenets of their religious order was that they were forbidden from retreating in battle. They fought alongside King Louis VII of France, and King Richard I of England and were a key force in defeating Saladin in Jersulem. By 1150, the Order's original mission of guarding pilgrims had changed into a mission of guarding their valuables through an innovative way of issuing letters of credit, an early precursor of modern banking. Pilgrims would visit a Templar house in their home country, depositing their deeds and valuables. The Templars would then give them a letter which would describe their holdings. While traveling, the pilgrims could present the letter to other Templars along the way, to "withdraw" funds from their account. This kept the pilgrims safe since they were not carrying valuables, and further increased the power of the Templars. The Knights' involvement in banking grew over time into a new basis for money, as Templars became increasingly involved in banking activities. The Templars' political connections and awareness of the essentially urban and commercial nature of the Holy Land naturally led the Order to a position of significant power. They owned large tracts of land, both in Europe and the Middle East, built churches and castles, bought farms and vineyards, were involved in manufacturing and import/export, had their own fleet of ships, and for a time even owned the entire island of Cyprus. Their success attracted the concern of many other orders, with the two most powerful rivals being the Knights Hospitaller and the Teutonic Knights. But the long-famed military acumen of the Templars began to stumble in the 1180s. When the Muslims re-took Jerusalem, it shook the foundation of the Templars, whose entire reason for being had been to support the efforts in the Holy Land. They attempted to drum up more support among European nobility to return to battle, but the French withdrew their own support of the war. Without the support of other countries, even the remarkable leadership of King Richard the Lion-Hearted could not prevail. The Templars suffered loss after loss. Additional crusades led by Louis IX of France and Edward I of England were unsuccessful. With each new loss, Europe had less interest in pursuing the losing battles of the Crusades. The Templars continued to lose more and more land, and after the Siege of Acre in 1291, they were forced to relocate their headquarters to the island of Cyprus. King Philip IV of France, deeply in debt to the Order, took advantage of the situation. 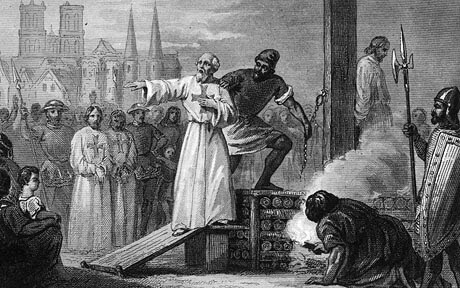 In 1307, many of the Order's members in France were arrested, tortured into giving false confessions, and then burned at the stake. Under pressure from King Philip, Pope Clement V disbanded the Order in 1312. The abrupt disappearance of a major part of the European infrastructure gave rise to speculation and legends, which have kept the "Templar" name alive into the modern day. But what happened to their kind – and does their order still exist? When Philip IV, King of France suppressed the order in 1307, King Edward II of England at first refused to believe the accusations. But after the intercession of Pope Clement V, Edward II ordered the seizure of members of the order in England on January 8, 1308. Only handfuls of Templars were duly arrested however. Most of the Templars acknowledged their belief that the Order's Master could give absolution was heretical, and were then reconciled with the church. In 1312, under further pressure from King Philip IV of France, Pope Clement V officially disbanded the Order at the Council of Vienne. In 1314, the remaining Templar leaders in France were executed, some by being burned at the stake. Clement issued a Papal Bull which granted the lands of the Templars to the Knights Hospitaller. Most Templars in England were never arrested, and the persecution of their leaders was brief. The order was dissolved due to damaged reputation, but given the pope and church's judgement of the order as free from guilt, all members in England were free to find themselves a new place in society. Templar lands and assets were given to the Order of the Hospital of Saint John, a sister military order—though the English crown held onto some assets until 1338. The largest portion of former Templars joined the Hospitallers, while other remaining members joined the Cistercian order, or lived on pension as lay members of society. The loss of the Holy Land as a base for war against the heathen had removed the primary reason for Templar existence, and the dissolved order now faded into history, in England as well as the rest of Europe. No clandestine secret-keeping, hiding, or underground organizations were necessary, though stories from later centuries often make use of the idea of a continuing, secret Templar presence. Baldock in Hertfordshire was a town founded by the Knights Templar and between 1199 and 1254 it was their English headquarters. Modern tradition has it that after the persecution began, the Templars were forced to meet in caves, tunnels and cellars in Hertfordshire and elsewhere in southeast England. Several modern organizations claim links with the medieval Templars. Some, such as the Sovereign Military Order of the Temple of Jerusalem (SMOTJ), also known as the "Ordo Supremus Militaris Templi Hierosolymitani" (OSMTH), have attained United Nations NGO (Non-Governmental Organization) status. However, there is often public confusion about the gap in time between the 14th century dismantling of the medieval Templars, and the 19th century rise of more contemporary organizations. The major non-Masonic, non-Catholic affiliated, ecumenical Templar organisation is the Ordo Supremus Militaris Templi Hierosolymitani. Tracing its ancestry back to 1804, the group stresses that "it reclaims the spirit of, but does not assert any direct descent from the ancient Order". Full members are Christians, but non-Christians are welcomed as "friends and supporters". Its branch in England and Wales, the Grand Priory of Knights Templar, has about 140 members. Many place names in England which use the word Temple have historic links with the Templars. Temple Church still stands on the site of the old Preceptory in London, and effigies of Crusading Templars can still be seen there today. In Yorkshire, Temple Newsam was one of the key Templar holdings. All these estates, with the exception of Faxfleet, Temple Hirst, and Temple Newsam, passed to the Hospitallers. In 1308 Sir John Crepping, Sheriff of Yorkshire, received the king's writ to arrest the Templars within the county and sequester all their property. Twenty-five Templars were placed in custody in York Castle and examined on the charge or heresy, idolatry, and other crimes, brought against the order by Pope Clement V and Philip IV of France. After a long-drawn-out trial, in which the evidence adduced against the knights was too flimsy to secure the desired conviction, a compromise was arrived at by which the brethren, without admitting their guilt, acknowledged that their order was strongly suspected of heresy and other charges from which they could not clear themselves. They then received absolution and were distributed amongst the various monasteries, many joining the Cistercians. Next year the suppression of the order was decreed by the pope, and a large portion or their estates was made over to the order of the Knights Hospitallers. At the time of its seizure in 1308 the preceptory of Newsam was one of the most wealthy in the county. Prof Malcolm Barber, from the University of Reading, has written widely on the Templars, sifting truth from myth. “Few historians today doubt that the charges were concocted and the confessions obtained by torture. But Templar innocence has been given no protection against modern sensationalism, for the raw material offered by the order's spectacular demise is too tempting to ignore. Among the first to exploit it were the 18th-century Freemasons. “The Freemasons adopted the legend of the murder of Hiram, king of Tyre, who was employed to build Solomon's Temple and was murdered because he would not reveal Masonic secrets. According to the Freemasons' version of history, the Templars were abolished because, as occupants of Solomon's Temple, they held key knowledge that could potentially discredit both church and state. Talk of the lost treasure of the Templars still abounds in England, but stories of secret caches in caves across the land have largely been discredited. As for the legend, the occasional glimpsed cross on the wall on in a place name are now all that, seemingly, remain of the once mighty order which for years held much of Europe in sway. But who knows? The York Rite or American Rite is one of several Rites of the worldwide fraternity known as Freemasonry. The three primary bodies in the York Rite are the Chapter of Royal Arch Masons, Council of Royal & Select Masters or Council of Cryptic Masons, and the Knights Templar, each of which are governed independently but are all considered to be a part of the York Rite. Throughout history it has been claimed that Freemasonry itself was founded by the Knights Templar or that the Knights Templar took refuge in Freemasonry after their persecution. The Grand Encampment of the United States acknowledges the existence of these theories but states that there is no proof to justify such claims. Friday 13th and the unlucky events of such supposedly takes it name from the happenings of the fateful Friday when the Templars were hunted down.